Most of the vocal recording I produce or engineer is for pop/folk/rock, and as such this article is focused on techniques appropriate to these styles. My preference is for lead vocals to be robust, clear, and detailed—larger than life. For me, the magic in a well-recorded vocal lies in the match of vocalist to microphone, preamp, and compression, all in deference to the production of the song. If time allows, I’ll test a number of mics for the task at hand. 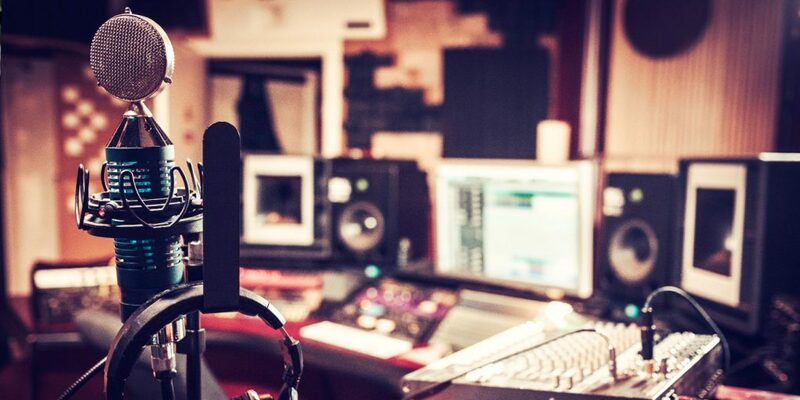 Ultimately I choose a mic, the distance from the vocalist to the mic, the height and angle of the mic, the use of mechanical plosive filtering (“pop filter(s)”), the type of preamp, compressor, and settings, all with relation to the vibe of the production of the song. As a typical example of what’s involved in this process, in this article we’ll discuss my recording of the album Seven Hour Storm for Misner & Smith (misnerandsmith.com), a vocal-centric group. I’ve learned time and time again that whenever possible, it pays to avoid preconceptions about which mic to use in a given scenario. I’ve been collecting gear for decades and at this point I own a few outstanding vocal mics, including two of what mic guru Klaus Heyne refers to as the “Big Five”—the Neumann U 47, U 67, and M 49, AKG C 12, and Telefunken ELA M 251. With that in mind, we started by setting up an asterisk-array test to determine the best mic choices for our two vocalists—in other words, we arrayed our mic choices in an “asterisk” around a single point so they could all be sung into at the same time, so we could quickly learn which of our mics was the best fit to each singer. We quickly learned from asterisk-array tests that neither my M 249 (a 1961 broadcast version of Neumann’s M 49) nor my C12 sounded best for the context of this album, for either vocalist! When all was said and done, we chose a variety of mics for lead vocals on this album, most often an AKG C 414 EB (with a CK 12 capsule) for Sam Misner’s lead vocals, and a Sanken CU-41 for Megan Smith’s. For specific songs calling for different approaches, we either used dynamic mics—a Shure SM7 and a Shure SM54—or ribbon mics—a Coles STC4038 and a Royer R-121. 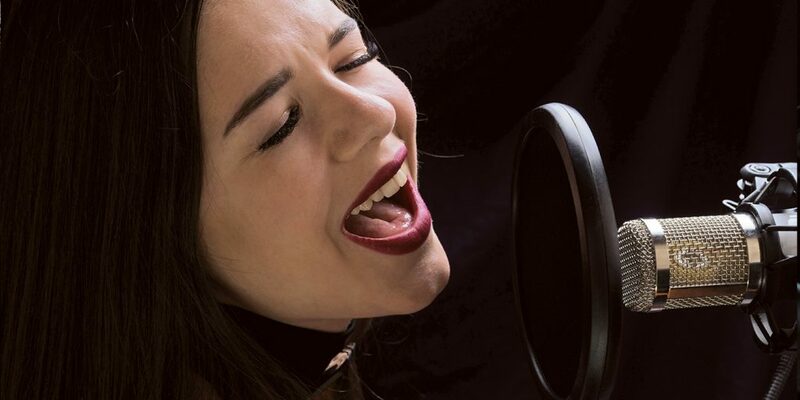 The relative position of the vocalist and microphone depend on a number of factors, including whether or not the vocalist is also performing simultaneously on an instrument, or is isolated from other vocalists or instrumentalists, the loudness of the vocalist, the quantity and character of plosives in the lyric, desired intimacy of the performance, and the singer’s skill at “working” the mic. I also pay attention to the “proximity effect” characteristics of the mic, avoiding it for inadvertent bass response, or taking advantage of it for weakness in the low range of the vocalist. 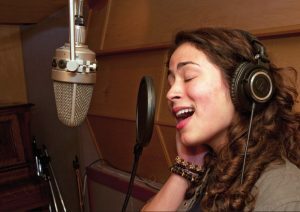 In the case of an isolated lead vocal overdub, I’ll usually ask a vocalist to keep a distance of approximately 8″ from the mic, requesting they “work the mic” by moving a little towards the mic at points in their range where they begin losing power, moving away from the mic when they’re belting. Because condenser and ribbon mics are sensitive to plosives (p’s, b’s, t’s) and to sound pressure in general, I try to avoid the most direct line from the vocalist’s mouth to the mic. 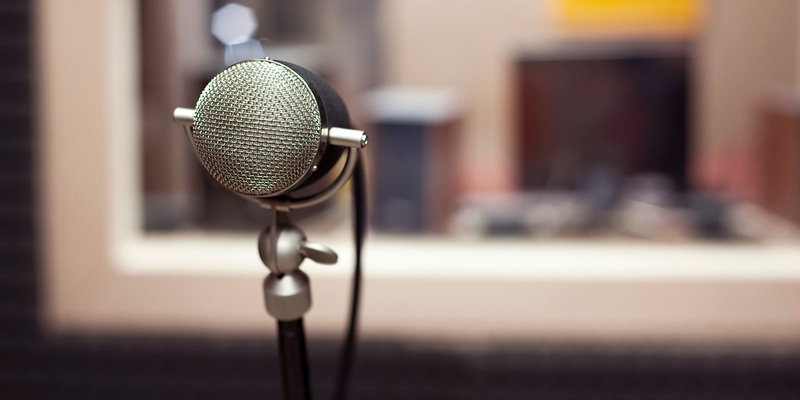 For that reason I rarely position the mic’s element (capsule or ribbon) at the same height as the vocalist’s mouth; instead, I either place the mic approximately 3/4″ above the vocalist’s mouth if I’m using a tall mic stand from which the mic hangs, or approximately 3/4″ below their mouth if the mic sits atop a stand. I choose whether to hang the mic or sit the mic atop a stand based on a number of factors, including whether or not the vocalist is playing an instrument while singing, whether or not the session is being photographed or videoed, and whether or not the mic is a tube mic. I once read—and believe—that it’s wise to hang tube mics, because of the heat generated by the tube. Capsule end down, the capsule hangs below the tube, and the heat from the tube rises away from the capsule, thereby hopefully keeping the capsule’s response more consistent over the course of a session during which the mic gradually becomes physically warmer. This should expose the capsule to less heat over the course of its lifetime. When considering the angle of especially condenser and ribbon mics, I’ll almost always angle the top of the capsule or ribbon approximately 15º away from the vocalist, to reduce possible distortion caused by a direct hit of high sound pressure. Beyond this, I take into account the number of plosives in the lyric, and the way in which the singer is enunciating them; if necessary I’ll angle the top up to as far as approximately 30º away from the vocalist. I don’t use dynamic mics frequently in recording lead vocals, but I do use them occasionally. Usually I turn to a dynamic mic either to capture a “live”, or harsher sound and feel, or when isolation is an important consideration because the lead vocalist is singing while among a group of musicians. I’ll almost always position the dynamic mic’s diaphragm at the same height as the vocalist’s mouth, and ask the singer to be approximately 1″ or closer to the mic, knowing that dynamic mics are less sensitive to plosives and sound pressure, and that this closeness is likely contextually appropriate. If a vocalist tends to “eat the mic” when performing live, you can reproduce that vibe in the studio with a similar mic placement. Once the mic is chosen and set up at the desired height and angle, I’ll always set up at least one plosive (“pop”) filter on a mic stand, and leave it close by, so that once we start rolling, if we need it, it’s right there to be moved into position. My favorite these days is an Audix PD133. Maybe I’m only imagining it, but compared to other similar-looking filters, it seems to perform just as well at reducing plosives, while otherwise leaving less of a sonic footprint. In addition to the first filter, I’ll have a second, and depending on the vocalist and the song, sometimes even a third filter set up and ready to swing into position! 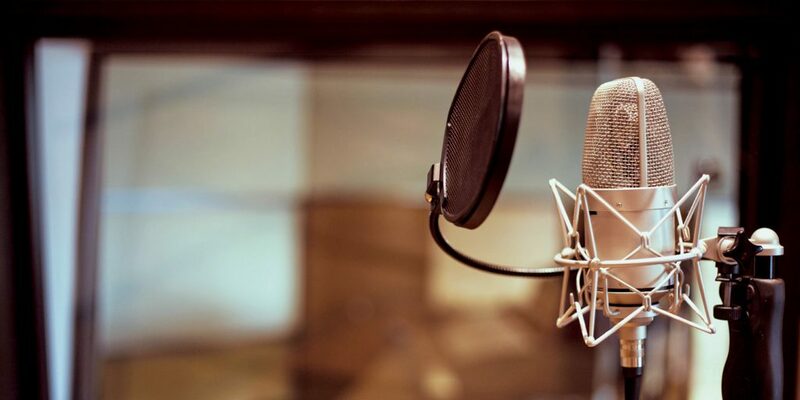 I almost always position the pop filter(s) at approximately 3″ to 5″ from the mic, depending on the power of the vocalist. I do this both to kill plosives away from the mic and to define for the vocalist the closest point to the mic at which I want them to sing. If I want the vocalist to move in on the mic to bolster weak spots in their range during the performance, I’ll ask them to get right up onto the pop filter. Keeping in mind the vibe of the production, I’ll choose the rest of the signal chain based on the sonic characteristics I desire. For me this usually boils down to choosing between technologies—tube versus discrete solid state versus integrated circuits. How one picks a preamp to match a mic is a subject worthy of a whole article in itself, and experimentation yields great rewards and fun surprises. I almost always use some amount of compression, usually a very light amount of an opto compressor (I love my Pendulum OCL-2 for this), and very occasionally a small amount of limiting on top of that. Since it’s always possible to compress more later, and it’s impossible to remove compression from a signal to which it has already been applied, I don’t aggressively compress vocals while tracking unless I’m going for a very stylized vocal sound. When I do gently compress vocals during tracking, I almost always set the compression attack time slightly slower than the amount of time it takes for transient peaks to decay. 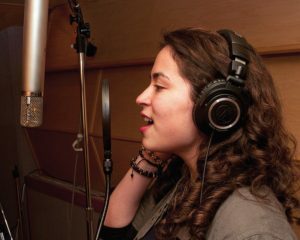 With care and attention, this approach yields a well-recorded vocal that will serve the track well. You can easily adjust these tips to work in your sessions… allow some time to experiment but don’t exhaust your singers in the process!